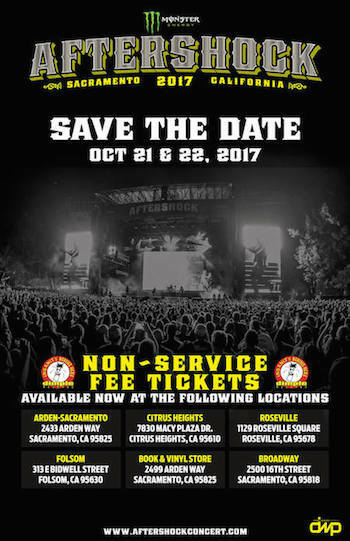 Monster Energy AFTERSHOCK—California's biggest rock festival—is set for Saturday, October 21 and Sunday, October 22 at Discovery Park, where the American and Sacramento Rivers meet, near downtown Sacramento, CA. Since 1993, music industry veteran Danny Wimmer has been producing concerts and festivals, both large and small. In 2011, he formed Danny Wimmer Presents, which now produces several of the largest rock and alternative festivals in the U.S. By combining A-list talent with local cuisine and culture, DWP has become recognized within the industry for delivering the highest-quality entertainment experiences to fans, artists, sponsors, partners and host cities. DWP creates memorable and all-encompassing festival experiences, leaving both consumers and partners with lasting and meaningful impressions. DWP will continue to add new music festivals to its already stellar portfolio, which includes Rock On The Range, Monster Energy Aftershock Festival, Monster Energy Welcome To Rockville, Monster Energy Carolina Rebellion, Louder Than Life, Chicago Open Air and Monster Energy Rock Allegiance, Bourbon & Beyond, among others.